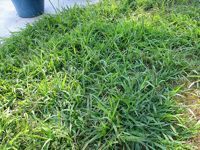 Crabgrass is one of the worst lawn weeds in the world, and when found in lawns the homeowner should never hesitate in removing or killing it as soon as possible. Due to the severity of the weed and how fast it can spread, Crabgrass simply must not be ignored. Crabgrass is easily known by most people, it is most noticeable by it’s wide leaf blade and grass like appearance. 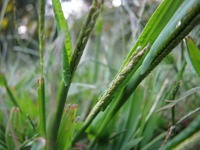 This grass, however will send out tough stems with fingers of seed heads at it tips. Crabgrass will become most prominent when it’s leaf blades grow faster than the surrounding lawn and when it reaches out and become taller than the other turf. The seed production of Crabgrass is extremely prolific. Every season, a single weed can send out thousands of seeds, so it’s easy to see how it can quickly spread and take-over and ruin an entire lawn. 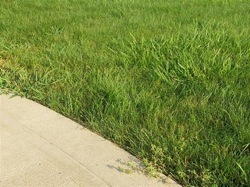 Ongoing control of Crabgrass involves regular year-round lawn mowing, which will aid in constantly removing new weed seeds as they are produced and before mature. Regular lawn mowing will also aid the lawn to grow more green leaf and thicken up to become healthier. A healthy lawn allows it to out-compete any Crabgrass infestations. Early and small infestations of Crabgrass can most easily be removed with a sharp knife which takes the weed out at the root, being careful not to spill any seeds on the lawn during the removal. Crabgrass is most easily controlled with the use of Pre-Emergent Crabgrass Herbicide. This must be applied to the lawn before the Crabgrass germinates for the new season. The herbicide is watered into the lawn so it can filtrate into the soil where the Crabgrass seeds exist. Pre-Emergent Crabgrass Herbicide is normally applied in early spring, but will have little effect on the weed once it has developed leaves. Post-Emergent Herbicides for Crabgrass are also available, these should be applied as early as possible in the growing season. Crabgrass must be as young and as weak as possible in order for these herbicides to work. Once the Crabgrass weed matures it can become extremely difficult, or impossible, to kill with herbicides. Some Crabgrass killers can also very effectively kill certain lawn types. Take note of the label of the Crabgrass herbicide you are considering buying – to be sure it is safe for use on your lawn type. If you are unsure of your lawn type, take a section of the lawn into your local nursery for identification by their trained staff.